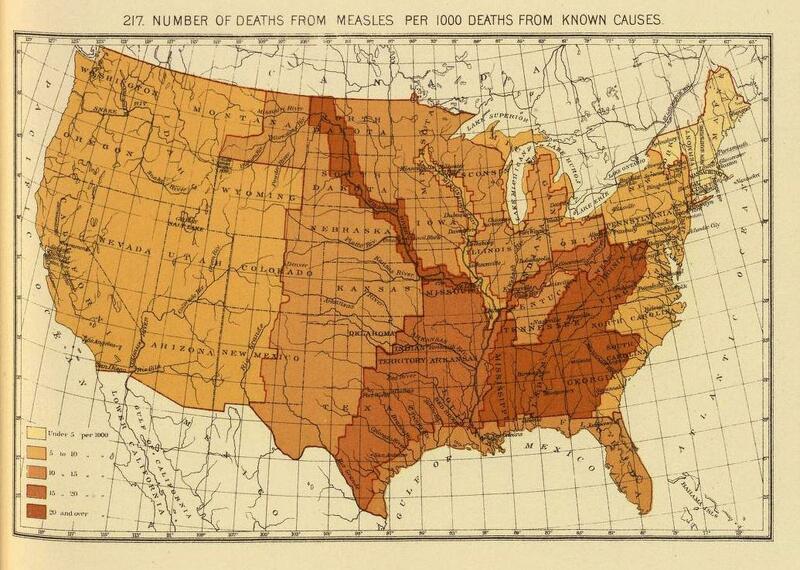 History of measles mortality: Maps from a time before vaccines. 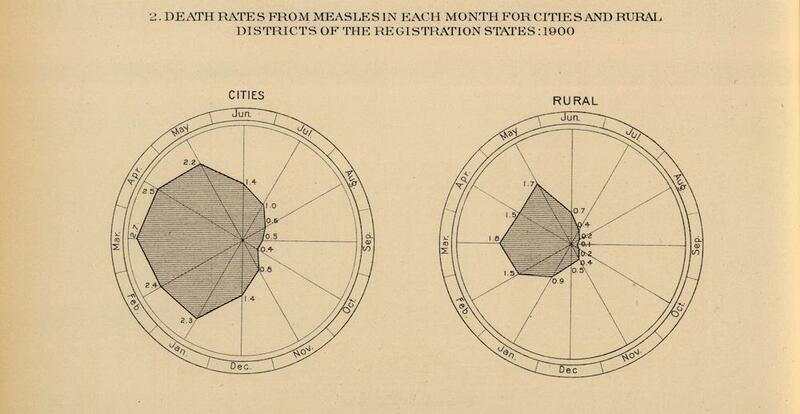 These maps of measles mortality appeared in three late-19th-century statistical atlases published by the Census Office. Experiments in data visualization, the atlases are modern in their scope and ambition. Since they were compiled in a time before the availability of vaccines for most childhood diseases (with smallpox being the exception), they are a good record of the former pervasiveness of measles. While late-19th-century medicine didn’t yet have a vaccine for the disease, doctors knew that it was easily transmissible. “Measles is a very infectious disease,” warned Dr. John Dewar in an 1890 book written for mothers and titled What Ails The Baby? “If a child be only taken into a room for a very short time, where another child is suffering from measles, it is almost certain to take it.” The 1898 map, second below, shows a pattern of measles deaths that is strikingly aligned with the course of the Mississippi River, illustrating how transmission could have been aided by river travel. Click on the images below to reach zoomable versions, or see their pages on the David Rumsey Map Collection site. Henry Gannett and Fletcher W. Hewes for the United States Census Office, “45. 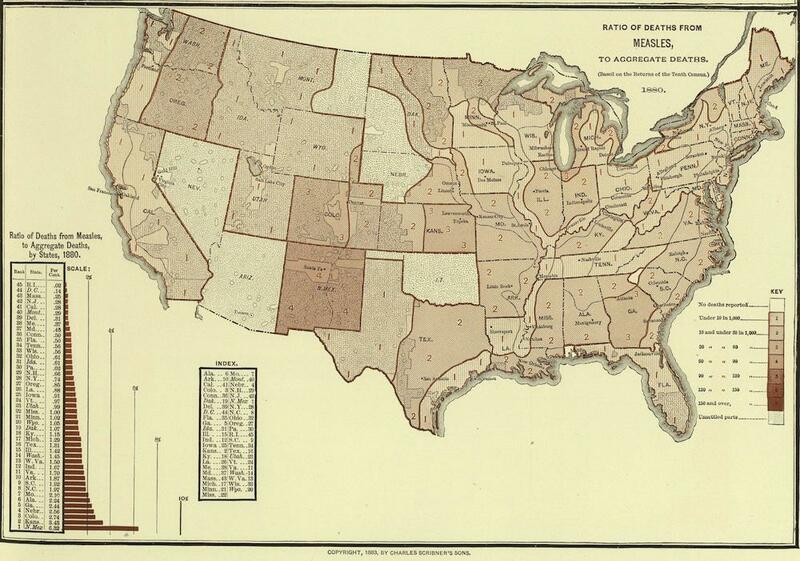 Deaths, whooping cough, measles.” Scribner’s statistical atlas of the United States, 1883. Henry Gannett for the United States Census Office, from page titled “41. Deaths from known causes.” Statistical Atlas of the United States, based upon results of the Eleventh Census (1890), 1898. Henry Gannett for the United States Census Office, from page titled “114. Deaths general diseases, measles 1900.” Twelfth Census of the United States, Taken in the year 1900, 1903.